It's here! 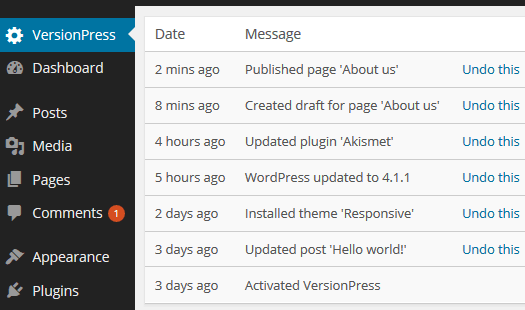 We're glad to announce the availability of VersionPress 1.0, the first stable release of what we hope to become an amazingly useful tool for WordPress admins around the world. Yet, with all the power of Git behind its back, it is easy to integrate with custom development tools and workflows, commit changes manually, push to hosting sites like GitHub or BitBucket, etc. We manage a couple of our sites this way and it's really a huge step forward. There is one important thing to understand about VersionPress: though it is technically a WordPress plugin, it is one of the most complex ones you can imagine. It's better to think about VersionPress as a long-term project and of v1 just as a milestone on a long road. Still, VersionPress 1.0 is important in many ways. The project grew from a hacky prototype a year ago to a solid piece of software that we already use in production for a couple of sites and some of our users report great success with it too. What we have today is sort of a minimum product that makes sense and is already useful, even if not yet very mature and somewhat limited in scope. So what it can do, specifically? The table that you see above fully works today. VersionPress can properly capture all actions that WordPress makes, convert them to a version control friendly format and commit them to a Git repository. It can do rollbacks to previous state, basically being a “Time Machine” for the website. It can also selectively undo certain actions – for example, you can go back to your previous theme while keeping the newer content updates. VersionPress works with many simpler WordPress plugins and even with some more advanced ones like Jetpack (though this one will receive some polishing in a future update). Both built-in and external themes are supported just fine. Furthermore, you can work with custom post types / fields, make commits manually in Git and still see them in the VersionPress table (and revert them), the repo can be either kept locally or pushed to a remote server, etc. It can do a lot already. There are of course also quite a few things that don't work yet or are not supported properly. From the feature perspective, we have two areas that will be the main focus for us in v2: staging and general user interface. Staging is actually sort of a holy grail for the project – it's where all the technicalities combine together to provide something that is very hard to do today. Also, a lot is left to be desired about the 1.0 GUI – it is rather bare and we have many ideas how to improve it. Besides these, we have other long-term goals like lowering system requirements, supporting more and more 3rd party plugins and so on – it's all listed on our roadmap. As you can see, VersionPress 1.0 is just a start but we're still very, very happy that we can share it with you today. Thanks to all of our backers and supporters who helped us get here. Since January, we distribute VersionPress through the Early Access Program which is sort of a mix between early access, crowd-funding and a standard support plan. We do this mainly to set the right expectations and we really mean it when we say that VersionPress is young and imperfect yet. On the other hand, we know a lot of people in the WordPress community have been waiting for a versioning solution and even during the alpha / beta stage, we had users who reported success with it and hundreds of you joined us even pre-1.0! So it just makes sense to open VersionPress to anyone interested. You can join the EAP here. Thank you if you decide to! We intend to release new major versions approximately every three months and have already started work on v2. It is possible that some smaller changes and/or fixes would ship sooner but we generally strive to be releasing versions 1, 2, 3 etc. rather quickly like modern browsers do. We really want this project to develop rapidly and start being useful to a broader set of WordPress users. VersionPress 1.0 has been a long time in the making and we're really happy to see it released. It is an entry point to future releases where we think VersionPress will really start shining. Thanks for being with us on this road and if you want to be kept up to date, please follow us on Twitter or Facebook.